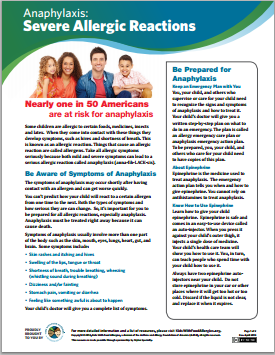 Anaphylaxis affects at least one in 50 people living in the U.S.
Anaphylaxis (anna-fih-LACK-sis) is a serious allergic reaction that is rapid in onset and may cause death. Ask your doctor for a complete list of symptoms and an anaphylaxis action plan. Anaphylaxis must be treated right away to provide the best chance for improvement and prevent serious, potentially life-threatening complications. Epinephrine (ep-uh-NEF-rin) is the most important treatment available. Always carry two epinephrine auto-injectors so you can quickly treat a reaction wherever you are. (Learn more on our related website for Kids With Food Allergies: Epinephrine Is the First Line of Treatment for Severe Allergic Reactions). Promptly inject the medicine at the first sign of an anaphylactic reaction. Consider carrying your anaphylaxis action plan along with your auto-injectors. Call 911 to go to a hospital by ambulance. You must seek medical care immediately – even if you feel better – because symptoms can recur. You may need other treatments, in addition to epinephrine. If you think you are having anaphylaxis, use your self-injectable epinephrine and call 911. Do not delay. Do not take antihistamines in place of epinephrine. Epinephrine is the most effective treatment for anaphylaxis. An allergy occurs when the body’s immune system sees something as harmful and reacts. Your immune system tries to remove or isolate the trigger. The result is symptoms such as vomiting or swelling. The most common triggers of anaphylaxis are allergens. Medicines, foods, insect stings and bites, and latex most often cause severe allergic reactions. Common culprits are penicillin and other antibiotics, aspirin and aspirin-related products and insulin. In the U.S., the most common food allergies are peanuts, tree nuts, shellfish, fish, milk, eggs, soy and wheat. These are the “top 8 allergens.” In children, the most common food allergies are milk, eggs, peanuts, soy and wheat. In adults, the most common food allergies are shellfish, tree nuts and peanuts. Stinging insects such as bees, wasps, hornets, yellow jackets and fire ants can cause anaphylaxis. Certain tick bites can cause a person to develop severe allergic reactions to meat. Bites from the "kissing bug" and deer fly also cause a local allergic reaction. Natural rubber latex may cause a mild skin irritation or it can trigger a severe allergic reaction. Direct contact with latex items (latex gloves, condoms and balloons) can cause a reaction. Inhaling small latex particles that have become airborne can trigger latex allergy. Putting on and removing latex gloves can release small latex particles into the air. Exercise-induced anaphylaxis is a rare allergic reaction that occurs after vigorous physical activity. Temperature, seasonal changes, drugs, alcohol or eating certain foods before exercise may be co-factors. In other words, both exercise and this other factor have to be present for a person to have the severe allergic reaction. With proper evaluation, allergists identify most causes of anaphylaxis. Some people have allergic reactions without any known exposure to common allergens. If an allergist cannot identify a trigger, the condition is idiopathic anaphylaxis. How Can I Tell the Difference Between Anaphylaxis and Asthma? People with asthma often have allergies as well. This puts them at higher risk of developing anaphylaxis, which also can cause breathing problems. For that reason, it is important to manage your asthma well. Some of the symptoms of a severe allergic reaction or a severe asthma attack may seem similar. A helpful clue to tell the these apart is that anaphylaxis may closely follow ingestion of a medication, eating a specific food, or getting stung or bitten by an insect. Use your epinephrine auto-injector first (it treats both anaphylaxis and asthma). Then use your asthma relief inhaler (e.g. albuterol). Call 911 and go to the hospital by ambulance. What Can I Do to Prevent Anaphylaxis? Know your allergens. An accurate diagnosis is important. An allergist can help you create a plan to keep you safe. If you have a drug allergy, be familiar with both the generic name and brand names of medicines that cause you to have a severe allergic reaction. And be aware of ingredients in a combination product. Become familiar with medicines that might cause a cross-reaction. Read drug information carefully. If you react to insect stings or exercise, talk to your doctor about how to avoid these reactions. Carry your epinephrine auto-injectors with you at all times. This is very important and can save your life or the life of a loved one. Prepare with a plan. Have your doctor help you create an anaphylaxis action plan. Talk to your doctor and caregivers. Make sure they know the names of any medications you are allergic to and what symptoms you had when you took them. Give them a list of every drug you take. Some common medicines, like beta-blockers, can worsen anaphylaxis. Wear a medical ID bracelet or necklace. It lets others know of your allergy in an emergency. Also, keep a card in your wallet or purse that explains your allergy. Keep your epinephrine auto-injectors on-hand at all times and be ready to use them if an emergency occurs. Talk with your doctor about your triggers and your symptoms. Your doctor may tell you to see an allergist. An allergist can help you identify your allergies and learn to manage your risk of severe reactions. Ask your doctor for an anaphylaxis action plan. This will help you know what to do if you experience anaphylaxis. Medical Review October 2015, updated February 2017.